The Pittsburgh Steelers have made such little noise during the free agency signing period that you might almost hear crickets chirping even though it is just now Spring. Quietly, the Steelers brought in former Clemson quarterback Tajh Boyd who was drafted in 2014 by the New York Jets and then cut in preseason camp. With a career in question, Boyd attended Clemson’s recent Pro Day and was signed by the Steelers, giving him a second chance and perhaps setting up a training camp battle for the third roster spot at the quarterback position between him and Landry Jones; perhaps even Bruce Gradkowski. The 6’1″, 225 pound quarterback didn’t sit around even after he was cut by the Jets. Instead, Boyd moved to the Fall Experimental Football League (FXFL), a developmental league for the NFL. He spent time on the roster with both the Boston Brawlers and Florida Blacktips. As a Senior for Clemson, Boyd helped lead the Tigers to an 11-2 record by completing 283/413 passes for 3,851 yards and 34 touchdowns. In November of the 2013 season, Boyd set the ACC career passing touchdowns record and finished with school and conference records for passing yards (11,904) and passing touchdowns (107). One of Boyd’s strengths in college was his ability to keep moving his feet while scanning downfield for open receivers. Boyd is creative, using his arm strength to make accurate passes in mid- to long-range. Boyd is quick and unafraid to tuck the ball and run, especially on critical third-down situations. Boyd sets quickly and puts zip on his passes but is able to touch-pass to deep receivers and put it in the perfect place for a catch. He has good composure even when the pocket breaks down and is able to roll the pocket and throw on the run (both left and right). A dual-threat quarterback, Boyd has the off-field character that matches his charisma on the field. Despite lacking the ideal height for a prototypical NFL quarterback, Boyd will need work on letting plays unfold and remaining durable instead of lowering his shoulder and being willing to take a hit. Effective pump fake that makes defenders bite and creates space for his receivers. 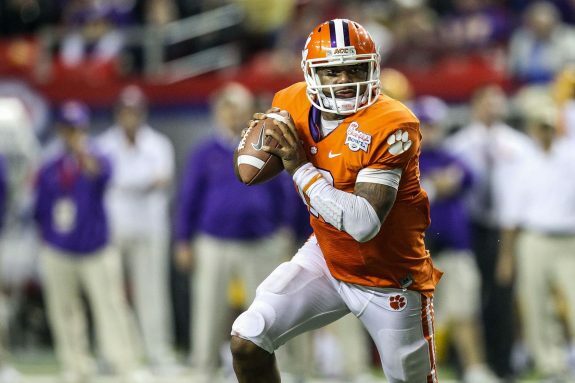 2 Comments on "Steelers Player Profile: Tajh Boyd"
Tajh Boyd was a legend at Clemson, where he played behind a superb line and had Sammy Watkins and M. Bryant for receivers. But some superb college QBs lack the skills to excel in the pros: Tim Tebow, Chad Pennington, Steve Spurrier, Todd Blackledge, and John Huarte come immediately to mind. Boyd so underwhelmed pro scouts in 2014 — he didn’t read defenses well, he wasn’t blazing fast, he was short and had trouble seeing over big linemen — that he dropped to the sixth round (213th pick). The Jets took a flyer on him and cut him in August, 2014. His FXFL play didn’t inspire offers. He worked out for the Lions last month and came up empty. In short,he has yet to prove he is capable of being a pro QB. My guess is that Tomlin hopes to use him in practice to emulate the speed and scrambling style of QBs like Michael Vick who shine in spread offenses or maybe to have him return kicks or even convert him to RB like Paul Hornung or Eddie Podolak. If he makes the team, Haley might devise a package to take advantage of his unique skills. But unless he has improved remarkably, I don’t see him displacing Gradkowski or backing up anybody at QB in Pittsburgh. Good point Dr. George . The question I have is , why do we bring a player like this in that we have absolutely no use for . We currently have three quarterbacks on the roster . Roethlisberger , Gradkowski and Landry Jones . Bottom line , he will never see the field . On the other side of the coin we have a secondary that is shaping up to be one of the worst in the league and they have completely ignored it . There were players they could have signed but made no effort to do it . If this team ends up having a mediocre year and the defense is getting lit up every week , the fans are not going to be kind and the Steelers are bringing it on themselves .